Adverts are the main source of Revenue for DoveMed. Please remove adblock to help us create the best medical content found on the Internet. 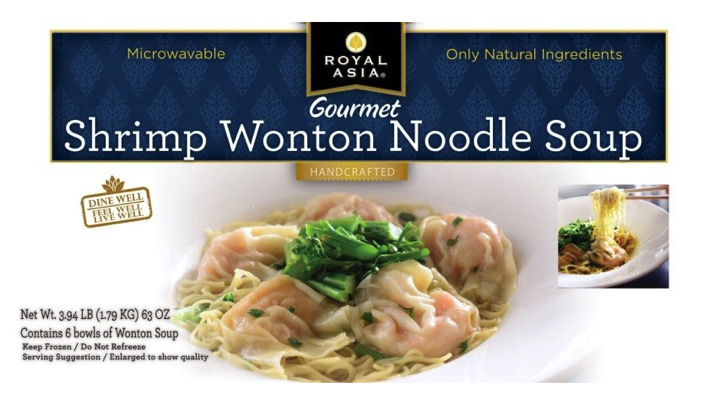 TAI FOONG USA of Seattle, WA is recalling Royal Asia Shrimp Wonton Noodle Soup, because it may contain undeclared egg. TAI FOONG USA of Seattle, WA is recalling Royal Asia Shrimp Wonton Noodle Soup, because it may contain undeclared egg. People who have an allergy or severe sensitivity to egg or egg products run the risk of serious or life-threatening allergic reaction if they consume these products. Individuals who are not allergic to eggs may safely consume this product. Product was distributed in Washington, Oregon, Montana, Idaho, Utah and Alaska and were purchased exclusively at Costco beginning January 2017. Royal Asia Shrimp Wonton Noodle Soup; Net weight 3.94lb (1.79kg) 63oz; 6 bowl pack. One allergic reaction complaint has been CONFIRMED to date. The recall was initiated after the product was tested for presence of egg, and was confirmed. Because the packaging does not reveal the presence of Egg the product was immediately pulled from the shelves at Costco and destroyed, all other product was identified and isolated in the cold storage facilities and placed on hold to be properly labeled. This recall is being made with the knowledge of the U.S. Food and Drug Administration. Tai Foong USA is asking consumers to return product to the store where purchased to request a full refund if there is an allergy concern. Affected product should then be discarded in a secure place and not consumed. Materials provided by U.S Food and Drug Administration. Note: Content may be edited for style and length. Disclaimer: DoveMed is not responsible for the accuracy of the adapted version of news releases posted to DoveMed by contributing universities and institutions.